"Brilliant color photography of Union Pacific's fabled 4-8-4 in action..." reported "Railfan Magazine" in their review of this book. 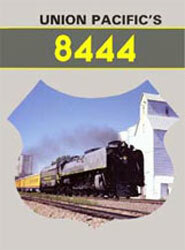 This book depicts the fan-trip career (which is now more than double the locomotive's regular service career!) of the 844/8444 beginning in 1960. Includes Sherman Hill, jaunts to Oregon, doubleheading with UP 3985 and the restoration of the two-tone Greyhound livery that the locomotive once wore in regular service when pulling crack passenger trains. 18 pages; 8.5” x 11” Softcover.